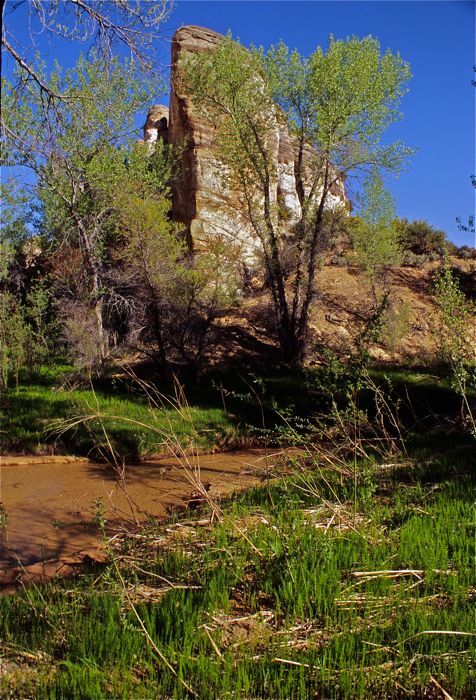 Backpacking Utah’s Slickrock Canyon Country is unlike exploring any other landscape on Earth; it is an unbelievably colorful region of deep red-walled canyons with clear streams flanked by a lush growth of willow and cottonwood. There are slot canyons and ancient Indian ruins, too. It is spectacular! Above the canyons are high, wide-open mesas of sprawling “slickrock” sandstone, plus sandstone domes, sand dunes, arches and many other spectacular geologic features. Open woodlands of juniper and pinyon provide additional greenery, and from these mesas you can see forever! Backpacking in Utah with Big Wild is a truly unique experience. 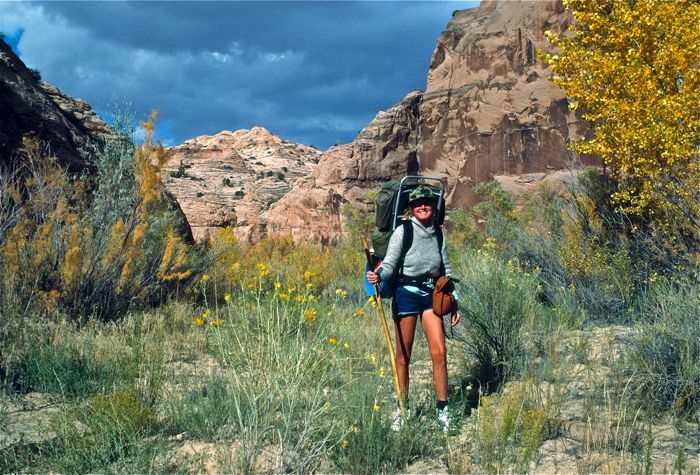 Big Wild Adventures has been organizing and leading some of the best Utah backpacking trips into the canyon country wilderness for over three decades. 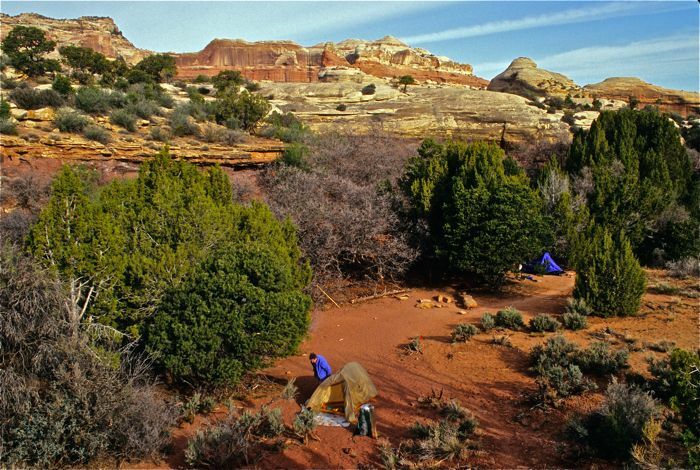 Join us in the big wilds of Canyonlands National Park, the Escalante Canyons and the Utah Grand Staircase backcountry of the Grand Staircase-Escalante National Monument. By the way, the Grand Staircase trip is one of our more rugged and remote Utah backpacking trips. The Utah backcountry is among the most exciting and primeval landscapes on Earth! Please note that our Utah hiking trips may fill up quickly, and we take reservations on a first-come, first-served basis. So don’t miss out! To reserve your space, call 406-848-7000. We can’t wait to backpack southern Utah and explore the colorful wilds with you! Utah $1,900 (inclusive*) • April 22-27, 2019 Note: This trip is full. *All trip prices include equipment (backpack, day-pack, tent, sleeping bag and pad, eating utensils), food and cooking (3 meals/day plus snacks), cooking gear, trip planning, comprehensive safety instruction, all user/permit fees, transportation from town to and from the trailheads, and our professional guide/naturalist staff. There is a $300 discount if you bring your own equipment. Utah is a land of such radical and amazing diversity that it is difficult to characterize it in a small amount of space. Nonetheless, we’ll give it a try. North-central and northeastern Utah harbor the two most famous mountain ranges in the state, the Wasatch and the Uintas. Though there are few chunks of big wilderness in the Wasatch, the High Uintas Wilderness is the largest high mountain wild area in Utah. Though less isolated and wild, the Wasatch Mountains form a striking backdrop to the Greater Salt Lake City Utah metropolitan area, also known as the “Wasatch Front”. Big Wild Adventures eschews hiking near large metropolitan areas. We want our clients to experience real wilderness in a remote setting, with minimal light pollution and maximum wildness. Fortunately, when the Wasatch Front is in the rear-view mirror, wild Utah quickly begins to assert herself, and what an assertion it is! Although there are many other rugged Utah mountain ranges beyond the Wasatch and the Uintas, it is the Canyon Country that comprises Utah habitat for Big Wild Adventures. This otherworldly landscape of southern Utah forms the bulk of a geographic region unlike any other on Earth. 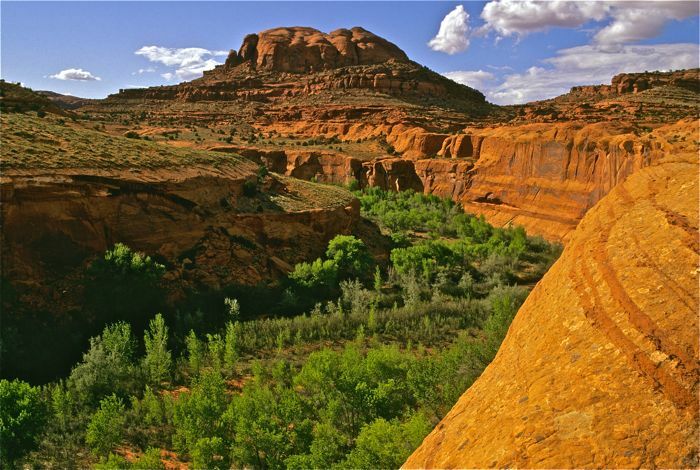 Geologists call it the Colorado Plateau, but in popular jargon much of this Utah landscape is simply known as “Canyon Country”. Or “Slickrock Country”. 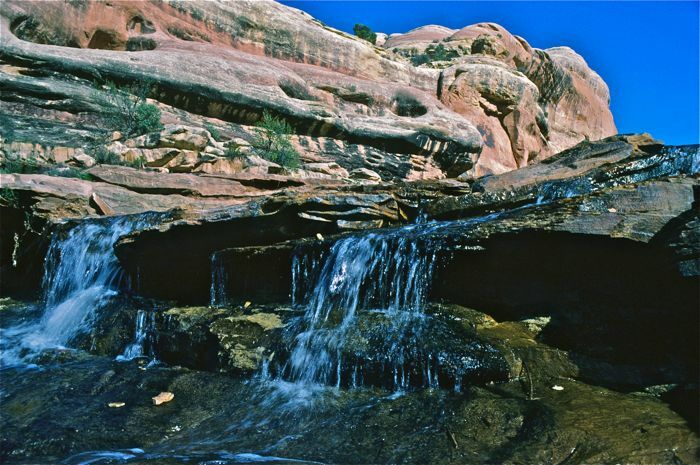 Or “Red-rock Canyon Country” or even “Canyonlands”, although that name is more properly reserved for Canyonlands National Park, one of Canyon Country’s major protected areas and a place frequented by Big Wild Adventures. Whatever you call it, though, you get the picture. To call Canyon Country in Utah colorful understates the reality. A kaleidoscope of colored rocks dominate the scenery, and yes, many of the rocks are red or reddish, a facet of the iron oxide that results from weathering rock in the high desert Utah climate. But exploring in Utah’s Canyon Country isn’t just about the rocks and their colors. Deep, often vertical-walled canyons slice through the Utah plateaus. Amazingly verdant plant communities flank cool clear canyon-bottom streams, though some of the Utah canyons are as dry as the Sahara. Don’t worry, though, Big Wild guides know which canyons have water. And some of the canyons are true slots; so narrow that one must turn sideways in order to move! There’s something in the Utah high desert Canyon Country for most everyone, and while Big Wild co-owner Howie Wolke feels claustrophobic in the slots, he loves the wide-open expanses of the “slickrock desert” plateaus that rim the canyons. And why not? The views are vast; the skies are deep blue and starry-black at night. The twisted junipers and other desert-adapted plants are widely-spaced and therefore have developed an individualism that seems lacking among plants in wetter, more botanically-crowded environs. And the snow-capped peaks of the not-too distant Henry, Abajo, and LaSalle Mountains frame the colorful arid canyon and mesa wilds. 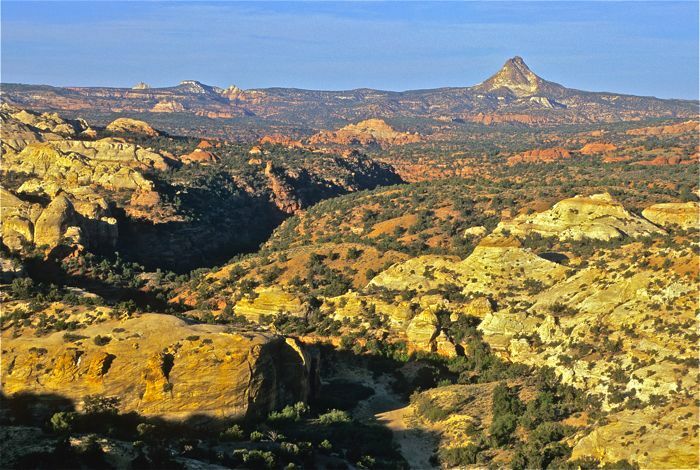 If you’re looking for a really unique Utah adventure, please join us in the wilds of the Escalante Canyons, or the Grand Staircase backcountry or the incomparable back of beyond in Canyonlands National Park! At the link below, you can read about all of our Utah backpacking and hiking trips for the current year.